I'm in for a few of the 15 round mags when they are ready. I picked up a few 10 rounders and really enjoy the reliability and aesthetics. Keep up the great work. I finally had the opportunity to fire my new 20" VEPR over the weekend. I had already performed the bolt modification in anticipation of a shooting session. Equipped with 3 new 10 round magazines from CSSpecs, I had ZERO failures to feed, extract or fire. I am so very impressed with the quality of the CSSpecs magazines and they look so much better than the plastic 5-rounders that came in the box with the rifle. I just want to say thanks to everybody for the wonderful source of information presented on this forum and thanks to CSSpecs for the top quality magazines. +1 to csspecs for the great 54r mags! I recently picked up another one, and they sent me a free coaster!! Took the new mag to the range to test and, guess what? Worked perfectly just like all the others I have!! Just so people know, we are out of the coasters so no more of them.. Sorry. just wanted to update that we should have the bigger 15 round spring in just a few more weeks. If it works we will start a production run right away. Would you be willing to post up some detailed pics of your filed bolt? i lightly filed mine down (post 2014 dish cut) and its better, but still low feed jams, and i dont want to screw up the bolt by filing too much or at the wrong angle. I don't have any pictures to post as of right now, but you are on the right track. Judging from your immense picture, I can say that you are about halfway from the goal. Just take that bevel all the way to the rear of the bolt and you will be fine. If you'll go to the CSSpecs website, they show the proper amount of bevel to have on your bolt. Really, unless you start getting into the locking lug or just take off crazy amounts of material, you will be fine. Hey guys I just wanted to check in and see if there had been any update on the 15 round mags. Last post from csspecs is from December it looks like. Just anxious to hear about progress. Springs got delayed a little but have been here for a few weeks, I had family in town and got the flu the day after they left, while in the middle of a production run.. I intend to test fire the 15s either Thursday or Friday. I have had two of them sitting on my desk and they feel like they work, the spring loading is about perfect to make the rounds snap to the top... You do get a feel for this stuff after a decade, these feel pretty good. Anyway I'm taking the day off Wednesday, I'm going to go play tourist at one of the theme parks for the day, I figure I worked for three weeks straight including weekends with the Flu, I get a day off now that the batch of magazines is done. Eww sorry about the flu! That's no fun. Excited to see how the testing goes! Take your time, and have a good time off! 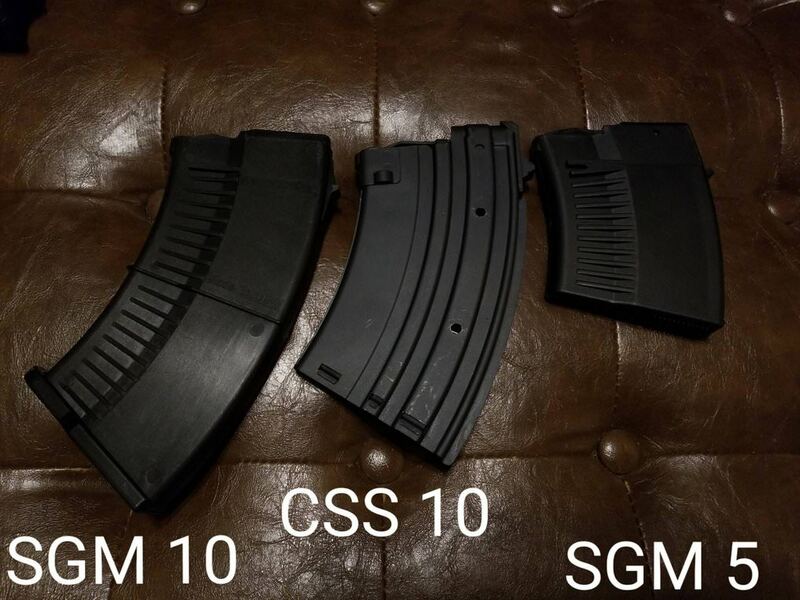 Just got my CSSPECS mags in. Here's a size comparison between the other popular options on the market. What's interesting to note is that right now, the all-steel CSSPECS magazine is $8 CHEAPER and a good inch SHORTER than the SGM plastic equivalent.